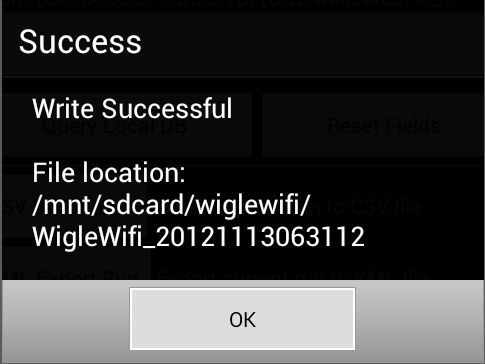 This is a quick tutorial on how to install and scan for wireless networks using the Wigle app on an Android phone, and how to save the scan to a file that can be loaded in Google Earth to visualize the scanned networks on a map. If you’re not familiar with Wigle.net you should visit the website. 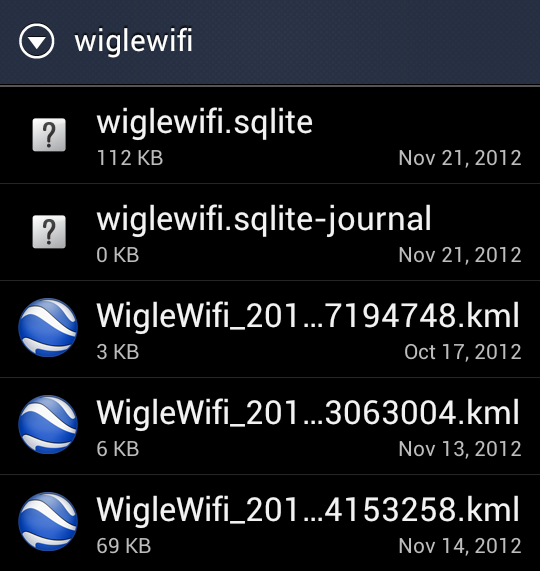 The Wigle site has a searchable database of over 75 million wireless networks that people have uploaded to it. NOTE: For these instructions I’m using a Droid4 phone with Android version 4.0.4. Go to the Google Play Store and search for Wigle. 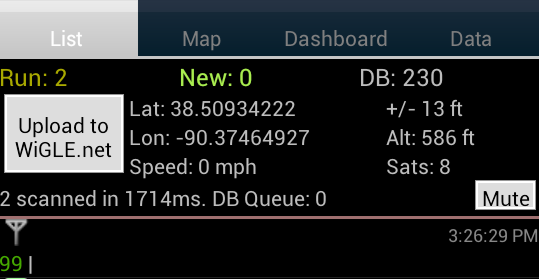 Tap on Wigle Wifi Wardriving in the Apps section. Depending on the speed of the network your on it might take a minute or two to download the Wigle app and install it. Go to the device Settings and tap on Wi-Fi to turn it on. Go to the Apps section and tap on the Wigle Icon. Wigles List view is the default. Bring up the Wigle app options and tap on Scan On. The List view will start filling up with networks that are being found. 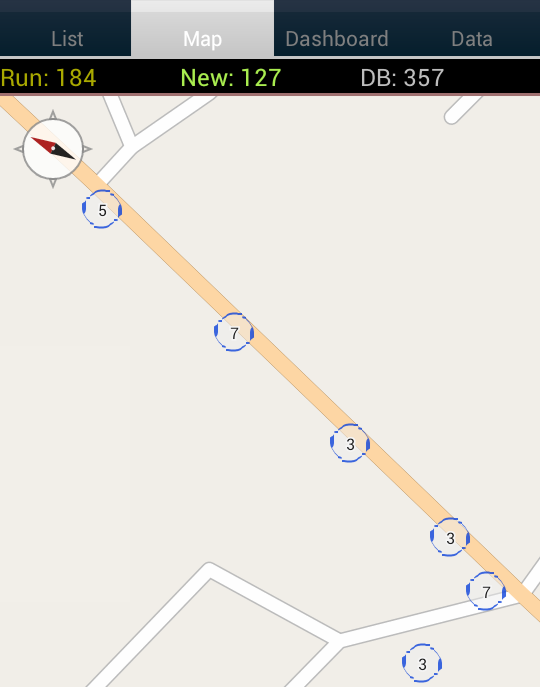 The Map tab will display the networks on a graphical map. The Dashboard tab will display scanning statistics. 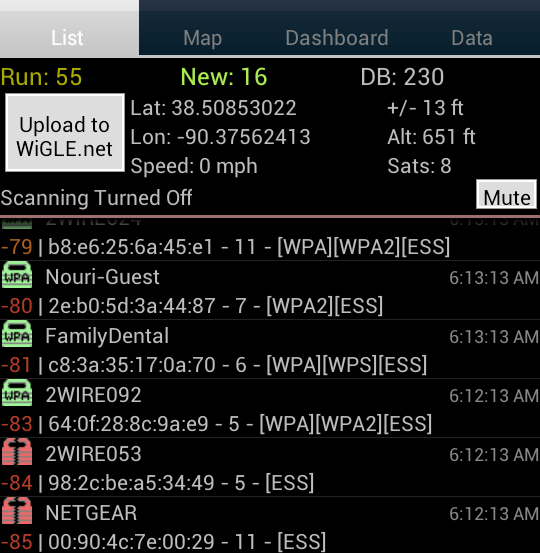 When done scanning bring up the Wigle options menu and tap on Scan Off. Bring up the Wigle options menu and tap on Settings. There are several settings to adjust how the program scans based on how fast your moving. You will probably want to experiment with these settings to see how they will affect your scanning. 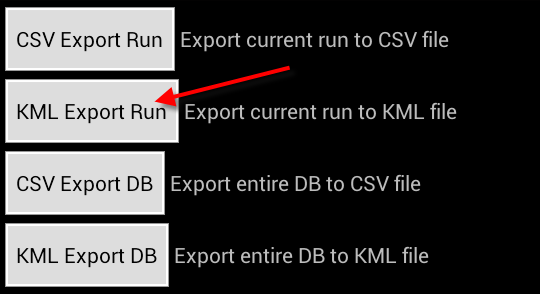 Go to the Data tab and tap on KML Export Run. Click OK to confirm the export. The Success screen will show the location along with the name of the KML file. The file name will include the date and time it was created after the underscore. Click OK. The Google Earth app will open and show the scanned networks. Double tap on the screen to zoom in. Tap on a pin icon to show the details of a network. Thanks for reading this blog about the Wigle app and please post any questions or comments you have. You can also visit my earlier blog post on how to Visualize Wi-Fi Networks Using Vistumbler and Google Earth.